Visibly angry and at times raising their voices, House Democrats slammed Republicans for sending Washington into shutdown mode. A last-minute move by the House GOP to seek a conference with the Senate on a continuing resolution ensured that the government shut down early Tuesday. 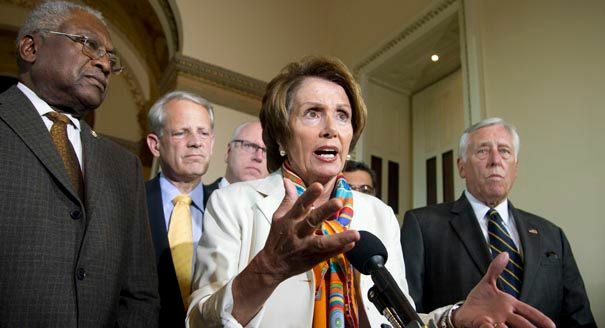 Pelosi said it wasn’t just about Obamacare. Oooooh, a “new order”. Has she been spending time in Colorado as of late? Well, I suppose it’s not all that hard to get a contact high if one wanders into Berkley. She referred to a quote by George Washington, in which he warned against a political party at war with its country. Ah, so now the GOP is at war with America. But, don’t worry, these aren’t “insults” like when Republicans say Senate Dems are lazy. I did appreciate that someone included a photo of Pelosi looking a bit wild eyed and need of a good lie down, as they say in jolly old England. Steny Hoyer seems to be thinking “the sedatives are sure taking awhile to kick in”.